Buckeyes are challenging the play for offsides. Called a goal on the ice, would make the score 3-1 OSU, 15:24 left/3rd. If it stands, it would be the first points in four games for Kunin and Frederic, who had assists. OSU is challenging offsides and it looks like they are gonna win it. No goal. Kunin was offside. Still 3-0 OSU over UW. Goal is waved off. Still 3-0 Buckeyes. After review, the play was deemed offside. It remains 3-0 with 15:24 to play in regulation. Contrary to what fans think at the moment, it was the right call. 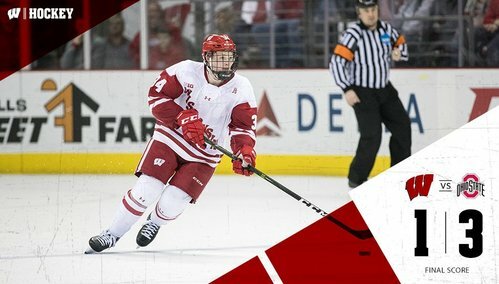 Labosky draws a hooking minor and the Badgers will have a power play with 14:02 on the clock. Labosky working hard in the corner and draws a penalty. Joshua again. He's pretty frustrated, drops an F-bomb as he skates into the box. UW man-advantage is shortened as Linhart takes a slashing penalty. Jake Linhart sent to the box for slashing and OSU will have about a minute and a half of PP time once the Joshua minor ends. OSU 3, UW 0, 12:20 left/3rd. UW slash on the power play makes teams 4x4, then a Buckeye power play. Berry with a solid sliding stop. None of the goals tonight have been his fault. Badgers are able to kill it off. Badgers kill it off but Wisconsin's at-large hopes crumbling away quickly. Berry stuffs Laczynski on an odd-man rush. 9:29 remaining. 9:29 left in the third, OSU leads UW 3-0. Badgers have 23 shots on goal but Buckeyes have blocked 23 UW attempts. OSU 3, UW 0, 9:29 left/3rd. Media timeout. Shots are 5-4 UW in the period, 27-23 OSU in the game. Wisconsin will get another power play. Absolute must score here for UW. Another UW PP on the way with 9:05 remaining. Buckeyes are called for holding. OSU's Lampasso is called for holding, putting the Badgers on their sixth power play, trailing 3-0 with 9:05 left. BADGERS GOAL: Luke Kunin scores on a one-timer on the power play, and UW has some life. OSU 3-1 with 8:23 left. Kunin buries one into the open net. 3-1 Buckeyes lead, 8:23 to go. OSU 3, UW 1 as Badgers convert on the power play. 8:23 left/3rd. That's definitely the first points in four games for Kunin (goal), Hughes (assist) and Frederic (assist). Frederic came off the bench on a rush and ripped one from up high but couldn't get it on net. 5:32 left, UW still trails by two. UW's Hughes just went off the ice holding his left arm. Looked to be in a lot of pain. Badgers pushing here for a goal but they are still down 3-1 with 2:48 left in the game. Badgers really turning on the pressure here but it might be too little, too late. 2:48 remaining. Also - Hughes got smashed into to the boards and went to bench clutching arm. Hughes appears to be doubled over behind the bench, being attended to by athletic trainer Andy Hrodey. Berry out of the net with 2:48 left. OSU ices the puck with 44.3 seconds left and the Buckeyes use their timeout. Buckeyes called for icing with 44.3 left, and they call timeout. 44.3 left. Wisconsin spending a ton of time in the zone but having trouble getting shots on net. Hughes is back on the ice for UW. 4.6, this one is all but over. 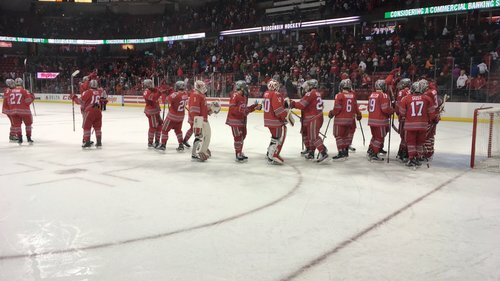 FINAL: Ohio State beats Wisconsin 3-1, sweeps the regular-season-finishing series at the Kohl Center. 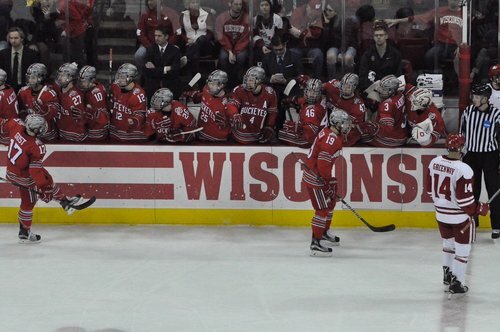 Wisconsin swept at home by the Buckeyes. UW probably going to need to win the conference tourney to get to the NCAA tournament. All four Badger seniors last to exit the ice as they finish up their final game at the Kohl. FINAL: No. 15 Ohio State 3, No. 16 Wisconsin 1. Badgers will play the Friday afternoon game in Detroit against the Ohio State-Michigan State winner. 3:30 Madison time. OSU blocked 29 #Badgers shots. UW's Ryan Wagner: "We can't really be giving them all those blocks like that, because they build off that." Buckeyes coach Steve Rohlik: "I give credit to our guys; they sacrificed themselves all over the rink." Tony Granato said he didn't have more info on how long Matt Jurusik is expected to be out. Goalie tried to skate this morning, he said.